Gretsch’s USA Custom series is completely hand-crafted in Gretch’s Ridgeland, SC factory by highly experienced and skilled drumsmiths. 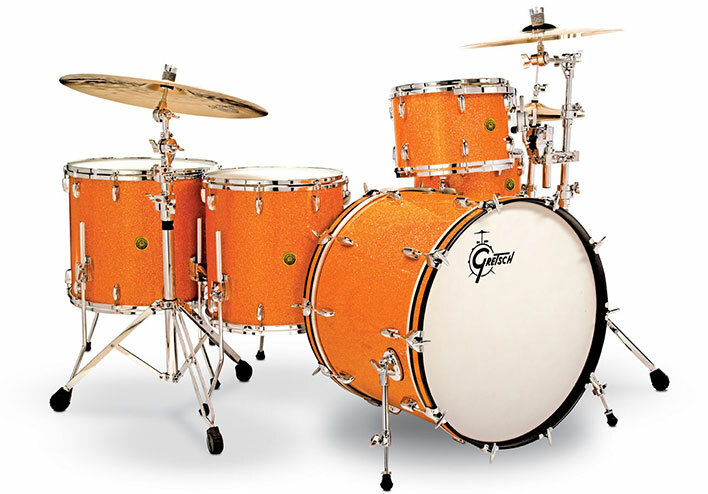 The Gretsch formula 6 ply maple shell, 30° bearing edges, Silver Sealer, die-cast hoops and custom finishes all combine to make a classic sound, with clear timbre, balanced tone, and explosive projection. You can customize Gretsch USA Custom drum sets “a la cart” by choosing your desired drum sizes, colors and hardware options. Already ready to start putting your kit together? Don’t hesitate to contact us. 6 ply maple shell with classic silver sealer interior. 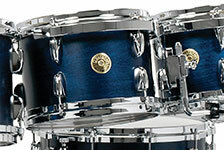 Curly Maple features an outer ply of figured curly maple that adds a distinctive appearance to any drum. All Nitro Cellulose finishes (gloss, satin, Harlequin) are available in Curly Maple. Gretsch Harlequin finish is a two-toned, triangular patterned finish that combines Piano Black Gloss with the finish of your choice. Available in any gloss or satin nitro cellulose finish. You can customize your Gretsch USA Custom bass drums with different hoops, t-rods, claw hooks, mount plates, cymbal holders, internal mufflers, and logo heads. You can customize your Gretsch USA Custom toms and snare drums with different brackets, tom holders, internal mufflers, and snare throw-offs. Looking for more information or ready to start building your custom configuration? Give us a call at 1-888-659-3477 or use the form below to contact us.